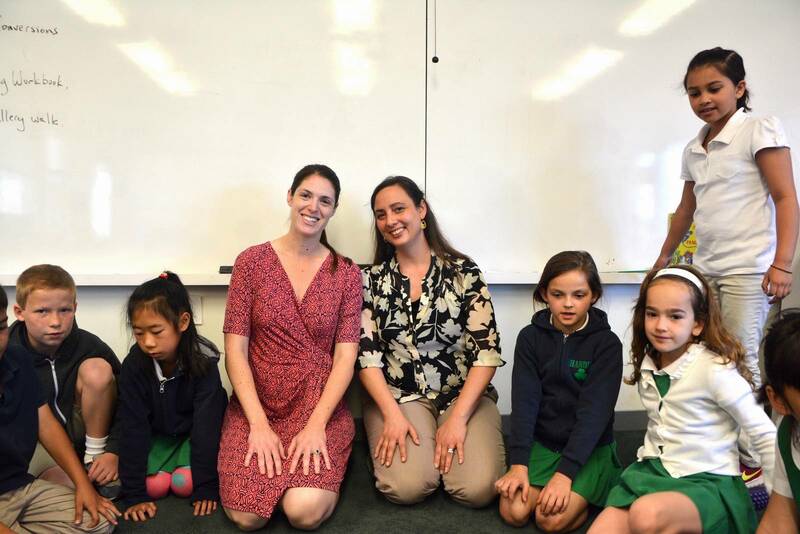 Chandler School of Pasadena announced that Jenn Johnson, a third-grade teaching assistant, attended a White House event last week hosted by First Lady Michelle Obama. The event was billed as “A Conversation on the Health of our Nation’s Youth” and featured remarks by First Lady Michelle Obama, Dominique Dawes, co-chair of the President’s Council on Fitness, Sports & Nutrition and three-time Olympic gymnast, and Dr. Karen DeSalvo, Acting Assistant Secretary for Health. Johnson, together with Chandler third-grade teacher Shelby Montevirgen, has created a classroom where students hop, skip, crawl, balance, jump, zombie walk and stomp as they learn math, spelling and other subjects. The two teachers hope to share their work at national educational conferences in the future. September, 2010 -- Chandler School kicked-off its project to build a brand new South Campus with a Groundbreaking Ceremony just before school resumed. The new campus facilities will more than double the teaching and learning space for Middle School students, from approximately 15,000 square feet in the old quarters, to 31,500 square feet in the new building. The new complex, which is slated to be ready for the start of the 2011-2012 school year, includes state-of-the-art designated classrooms for every teacher and Craftsman architecture to match the existing Lower School and neighborhood. The first phase of the project also will include: a new library and media center, three clustered science labs, a new multipurpose auditorium and enhanced courtyards. Approved by the city of Pasadena in 2008, the 15-year Chandler Master Development Plan will eventually bring to the South Campus music and art studios, athletic facility improvements and a new welcoming entrance on Seco Street with increased parking. "Our challenge is to best prepare our students for the future,” said Head of School John Finch to members of Chandler’s Board of Trustees, School Co-Founder Catherine Chandler and donors to the project who assembled for the ceremony. “The South Campus Project provides opportunities for us to strengthen our program for the future. Spacious new Middle School classrooms, art spaces, performance spaces and science laboratories will support our teachers and students to seamlessly integrate technology in their teaching and learning. These new spaces will provide the best learning environment for our teachers to better prepare our students,” said Mr. Finch. 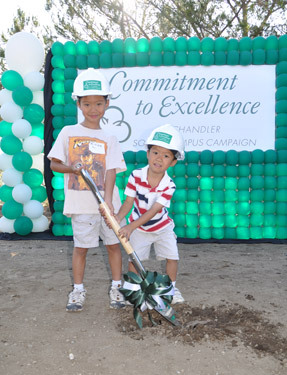 Prior to the start of construction, Chandler’s community of parents, alumni and friends, many of whom were gathered at the groundbreaking ceremony, already had contributed more than half of the approximately $14 million needed to complete the first phase of the project. As part of the initial fundraising effort, the School received the largest gift in its history, $1 million from an anonymous donor. “Everyone here today is a leader… and I thank you for that,” departing Board of Trustees President John Rouse told the assembled guests. Mr. Rouse also thanked members of the Board of Trustees for their vision and commitment to the project. “We’ve come a long way, but we’ve only just begun,” said Mr. Rouse. New Board of Trustees President Christopher Rising also spoke to those gathered about how much Chandler has been a part of his life. Not only was Mr. Rising a student here himself, but his siblings attended the school, his mother was on the Board of Trustees and his two daughters will start kindergarten in the fall. On that note he reminded attendees that it’s not just current students who will enjoy the new facilities, but also their children, and their grandchildren. As he closed his remarks, he invited attendees to follow him down to the construction site where everyone had the opportunity to scoop up a shovel full of dirt to commemorate the event. The South Campus Project is designed to support Chandler’s educational program, including a rich academic curriculum, a broad range of extracurricular opportunities and a faculty committed to the personal and academic growth of each child. The new Middle School building will create a learning environment that further enhances the program and contributes to the positive experience of a vibrant school community. The new and expanded spaces will provide opportunities for enhanced study, greater self expression and seamlessly integrated technology. It will further foster intellectual and social development among Chandler’s students and provide flexibility for scheduling and programs. The Commitment to Excellence Capital Campaign for the South Campus Project is being led by Chandler’s new Director of Development, Laura Dicovitsky. Mrs. Dicovitsky joined the Chandler team in July following former Director of Development Joyce Greif’s retirement after 31 years at the school. Mrs. Dicovitsky spent the last four years as the Director of Development at Foothill Country Day School in Claremont where she was responsible for all aspects of fundraising including the design and execution of a capital campaign and the development of a broad range of initiatives to engage alumni. Mrs. Dicovitsky earned her bachelor’s degree from the University of Virginia and her master’s degree from the University of North Carolina School of Journalism. Before embarking on a career in development Laura spent fifteen years in broadcast and print journalism. Her husband is Vice President for Development at the Prostate Cancer Foundation. The couple have two daughters in college. When completed, the more environmentally efficient South Campus buildings will further strengthen the School’s program and contribute to the positive experience of a vibrant school community. Chandler School is an independent, co-educational day school for students in kindergarten through eighth grade. Chandler School is known for its rigorous academic program, as well as for nurturing the social development of young students. The mission of the school is to provide each student with the highest quality and most academically challenging education in a nurturing, balanced, and diverse environment. Established in 1950 by Thomas and Catherine Chandler, the school has earned a reputation as offering an innovative, inspired academic program taught by caring, dedicated faculty. 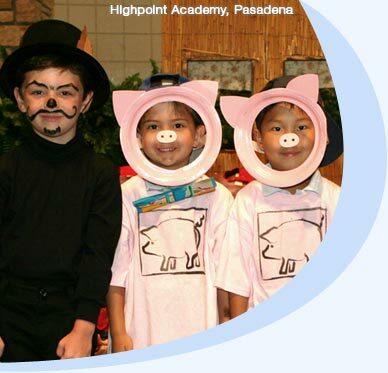 The school is located at 1005 Armada Drive in Pasadena, California, nestled in the foothills above the Rose Bowl.